"I am - just as you are - a unique, never-to-be-repeated event in this universe. Therefore, I have - just as you have - a unique, never-to-be-repeated role in this world." I am a lucky girl. If you've read this blog before, you may have read about how I have awesome friends that live in Southern California who have the best Meyer lemon tree in the world. I returned from my visit a few weeks ago with a bunch of those beauties. Meyer lemons are a little different than regular lemons. They are sweeter, and juicier. They are a cross between a Mandarin Orange and a lemon. They don't taste anything like an orange to me. They just taste like a deliciously sweet and super juicy, lemon. To me it's like someone said, "I wish there was a way to make a lemon better. Not as tart, and more juicy." And they fulfilled their dream. Zesting lemons and measuring the zest - To properly zest lemons, you really need a microplane. You just want to get the outside yellow peel, with no white pith underneath which is bitter. And it's a tool that can be used for so much more. It's one of my favorite kitchen tools and a great 10 dollar investment. Right now I am super blessed to have a bunch of these lovelies. I use them in so many ways. But when I'm not visiting my friends in California, I am able to get them this time of year in a bag at my local Safeway. But they aren't nearly as good. The taste is mostly the same, and while the supermarket Meyer lemon is jucier than a regular lemon, they aren't at all as juicy as the homegrown variety. I think it's because I pick the lemons myself from the tree and I'm picking them when they're ripe. Farms that sell to grocery stores don't have that luxury. These Meyer lemons are seriously so juicy, don't these look delicious? I use these lemons in applications where you would use regular lemons, they do alter the taste slightly, making it sweeter. In this cake, any lemon will do, regular or Meyer. This cake! It's good! I mean it's really good. Super easy, what takes the most time is zesting and juicing the lemons. After that's done, it's really a one bowl cake. You do mix the dry ingredients together and then add the wet, so you do mix the wet stuff together, but you do it in the same measuring cup that you measure the wet ingredients in, which doesn't really count as a bowl. So in my mind, it is a one bowl cake. One bowl and a spoon. You don't even need a mixer. The glaze in this cake soaks in the cake which gives it the texture of a pineapple upside down cake, a texture I really like. Moist and tender. The taste is of lemon with a slight cornmeal taste, which is unique and wonderful. The glaze brings it home and helps it read as a cake, as opposed to lemony cornbread. Mixed together - Look at how easy this recipe is! I've been eating gluten free these days for the most part. (To help with migraines.) And I made this cake gluten free. This cake works especially well as gluten free for 2 reasons. It has cornmeal in it as well as flour. So it doesn't rely only on the flour blend for taste and texture. The texture has a nice slightly crunchy way about it from the cornmeal and of course adds flavor. I used gluten free Bisquick in place of the all purpose flour in this recipe, this is really the only change I made. (Beside letting the batter sit for 15 minutes before baking, which is always helpful when using this product, it helps it rise better.) But any gluten free flour blend would work. I used gluten free Bisquick because I think it works amazing as a gf flour blend. So now that I'm eating gluten free mostly, I keep it on hand. The second reason it works well as a gluten free cake is that the glaze soaks in the cake, making it extra moist. My biggest problem with a lot of gluten free cakes and cupcakes is how they are especially crummy, and kind of fall apart when you eat them. And you know me. I like my baked goods extra moist. So this cake made gluten free, fixes the crumminess because the glaze holds it together better, as well as making it more moist. It also adds a pop of lemon flavor. In fact, I think I'm going to create a separate post to list this with the gf changes, as a gluten free lemon cornmeal cake since it was so successful. In fact I couldn't tell the difference between the regular version and the gluten free version, and neither could my husband. I just love getting all of these lemons. For baking for sure, I love the flavor. But I also use them everyday. I put lemons in my cold water, and I also drink a hot drink made of hot water, fresh lemon juice, slices of fresh ginger, and honey. I read an article where a nutritionist mentioned that one of her clients lost weight by simply creating this habit, of drinking lemon juice with fresh ginger and hot water. The reason is because it aids digestion. If I have too many lemons and I think they are going to go bad before I can consume them, I just zest the lemons, juice them and freeze the juice and the zest separately. Then I can use the elements as needed. I love this cake and since I always have lemons handy, it's a recipe I can have in my back pocket to make for guests for tea, or for brunch, or as a snack cake. It's casual, easy to make and tastes great. I think you're going to love it! Looking for more lemon recipes? Really Moist Lemon Cupcakes for Lemon Lovers - These cupcakes are one of my favorites. Moist, and full of lemon flavor, just like the title says. Lemon Cream Pudding - This pudding is amazing. It calls for just a few ingredients, it's rich, creamy and full of lemon flavor. In fact, it's going to be the dessert I make next with my current supply of lemons. I make it often, and serve it to company. It's always a hit. Meyer Lemon Marmalade - If you have a bunch of lemons like I do, make marmalade! Delicious on toast, and if you process and can it in canning jars, it will last a very long time. A nice burst of sunshine when you need it. Lemon Ricotta Cookies - This recipe comes from Giada De Laurentiis. They are cake like, and soft with a bright lemon flavor. These are some of my favorite cookies. I wanted to capture how moist and tender this cake is. It has the texture and consistency of pineapple upside down cake. Only it tastes like lemon, with a hint of cornmeal. Never miss a post! 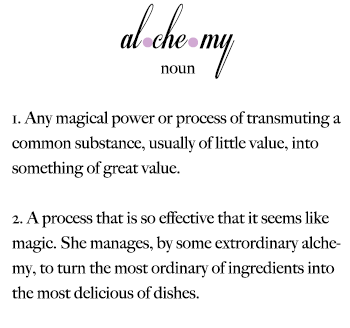 Follow The Alchemist on Facebook! Or Pinterest! Clear Vintage Glass Cake Stand, Vintage Art Deco Sterling Silver Cake Server, Haviland Limoges Sylvia Dessert Plates with pink roses, and the Haviland Limoges Sylvia teacups with pink roses, available at my Etsy shop, House of Lucien. If you don't have a springform pan, you can use a regular 9 inch cake pan, make sure to grease it well and line the bottom with parchment, then grease the parchment. Only fill the cake pan 2/3 of the way full (Since a regular cake pan doesn't have as high of sides as the springform pan.). You will probably have a little too much batter. For the extra batter you can make cupcakes, or just little cakes by baking them in oven safe ramekins, the small ones will be done much sooner, for a cupcake size about 18-20 minutes. Just make a little extra glaze for the extra cakes. Preheat oven to 350 degrees Fahrenheit, 180 degrees Celsius, Gas Mark 4. Pour the milk into a large measuring cup (2 cup or larger.) Add the lemon juice, stir and let sit for 10 minutes. Meanwhile, grease a 9 inch springform pan and line the bottom with parchment paper. Grease the paper. In a large bowl whisk together the flour, cornmeal, sugar, baking soda and salt. If it's been 10 minutes, stir the milk and lemon juice together again. Add the lemon zest, eggs, vanilla and oil to the measuring cup and stir well to break up the egg yolks. Add the wet mixture to the dry mixture. Stir together with a large spoon until it's blended together, don't overmix it. Just stir it enough so it's all incorporated. Pour the batter into the prepared pan and spread it out evenly. Bake for about 30-40 minutes. Until it passes a toothpick test and looks done in the center. Add the lemon zest and a few tablespoons of lemon juice to the powdered sugar and mix together. If it needs more lemon juice add a little more until you get the consistency of a glaze that is thick enough to pour and cover the cake well. When the cake is done, let it cool for 10 minutes. Run a knife around the edges of the pan to loosen it from the sides. Remove the sides of the springform pan and place it on a plate. Poke holes all over the cake using a skewer, (if you don't have a skewer, a fork will do.) Pour the glaze over the cake. Spread the glaze all around the sides. Go around the cake and spoon up the glaze that has fallen down the sides of the plate, and spoon it back on the sides of the cake so it's all covered well in glaze. Serve immediately or the cake can be stored in an airtight container for about 3 days. Thank you So much for this Important and Useful Information.